The benefits of adding auxiliary axes to your process is that it develops multiple work stations to increase productivity since the robot has more availability to tooling or parts while also reducing floor footprint. The greatest benefit of adding a multi-axis positioner to a production process is increased productivity, when compared to using robots with one fixed position. A manufacturer making a variety of sizes in automotive parts can use the same positioners to accommodate different sizes instead of one robot manufacturing a single size. Positioners gives the robot: better access to tooling or parts, reduces floor footprint, allows parts to be removed easily and gives the company flexibility to add multi-stations. Multi-stations provide the advantage of allowing the production staff to switch parts faster without a lot of downtime. Typically, there are 2, 3, 4 and 5 multi-axis positioners options available. This option uses two-axis motion with more flexibility compared to a tilt or rotational positioner. The biggest advantage is the part does not move outside the range of the robot. So, the process is more efficient and eliminates the need for the robot to move on a track. Thus, reducing overall cost. Drop Center position units are similar to the skyhook but the addition of tailstock provides greater load bearing capabilities. Thus, providing additional stability. The Drop Center option is very capable of handling longer / larger parts more efficiently. A turn table on a horizontal axis in a trunnion position allows the robot to have accessibility to side 1 of the tooling and then rotates to continue work on side 2, increasing the robot’s efficiency and reducing time spent changing tooling. Part positioners with multiple axis improve production and weld quality by allowing access to areas that were formerly unreachable or that required parts to be removed. It is manufactured with high precision cam for the lift. A 3-axis Sky Hook positioning robot suits application where the application requires continuous operation on different surfaces. This action will improve the quality, integrity, and appearance of the finished product. The Sky Hook 3-axis positioning system can be manufactured with high precision cam for the lift and rollover mechanism or with high precision acme screw and low backlash gear head for rollover. The Ferris Wheel position moves the part along the horizontal axis and uses two head/tail stocks. The advantage of the Ferris Wheel is that it allows the robot to work on the part on one side while the part on the other side is replaced. Customers with complex parts and increased productivity needs often select 4 & 5 Axis positioners. LazerArc 4 & 5-axis positioning systems are manufactured using a combination of zero backlash cam systems with low backlash gear heads to achieve high accuracy and repeatability. A 5 Axis Sky Hook is a good option for complex geometries that need to be lifted to different heights for the robot. The 5-axis L Sky Hook positioning system is manufactured for multiple part positioning and processing applications. LazerArc uses a combination of zero backlash cam systems with low backlash gear heads to achieve high accuracy and repeatability on all systems. LazerArc positioning systems are not catalogued items but customer specified assemblies designed to fit your application are capable of fitting into your automated robotic systems and units can be adapted to your specific servo motor or robot brand in order to expand manufacturing capabilities. Every application for positioning systems is different and each customer should be treated with any specific differences in mind. 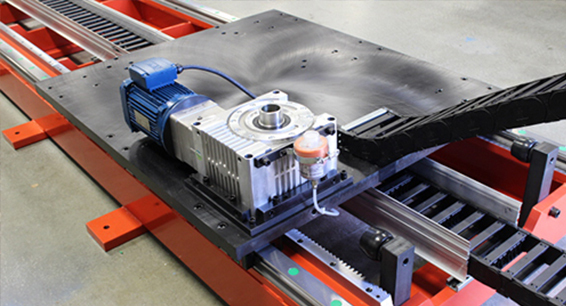 Lazerarc also provides custom Robot Linear Transfer Units. To read our guide, click here.